The dress is a creation from Ginger Rogers’ imagination. Rogers had a love for clothing and an eye for fashion trends, which she demonstrated whenever she could. 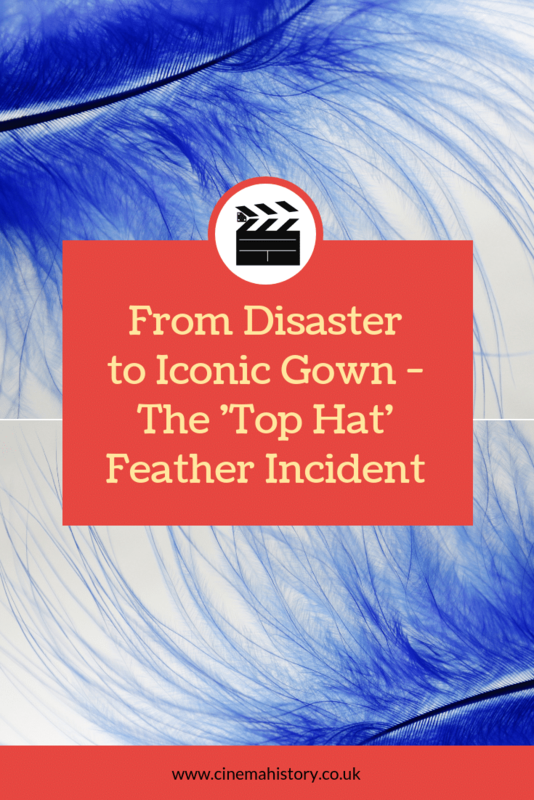 She approached RKO Costume Designer Bernard Newman with her idea of a brilliant blue dress with an ostrich feather skirt and cape. The long feathers would accentuate every movement, and the gown had an elegant swish to it. The wardrobe team set to work. The dress held over $1000 of ostrich feathers, which was extravagant considering the Depression. The dress took so long to make that is wasn’t seen by the cast and crew for approval until the day they shot the Cheek to Cheek routine. Co-star Fred Astaire, who approved all the costumes of his dance partners, was concerned and irritated by the number of feathers flying everywhere. The dance floor was covered in feathers. So were the actors. Astaire describes the incident in his autobiography as looking like “a chicken was attacked by a coyote”. When Rogers insisted on wearing the dress, all hell broke loose. Astaire got angry. Rogers cried. Rogers’ mother shouted at Astaire. Rogers refused to continue shooting unless she wore her dress. The crew had little choice but to agree to use the costume. The Wardrobe team had just one night to solve the problem. While they did fix the worst of it, you can still see feathers floating around on screen if you look carefully enough. Ultimately, Rogers was right to stand her ground. The dress was a hit with fans. It steals every shot while enhancing Rogers’ every move. The dress gives the dance routine an ethereal feel. Rogers seems like she’s gliding effortlessly around the stage.